Amelia Bright with her daughter Hazel at Amber Creek Farm in Fish Creek. Photograph: Catherine Forge, Source: Museum Victoria, 2016. Reflecting on why she became a farmer, 28-year-old Amelia Bright recalls that “I fell into farming by accident.” Amelia was living and working as a prosthetist in inner Melbourne before she decided to take the plunge at farming pigs with her husband Dan Bright in Fish Creek, South Gippsland. Both Amelia and Dan had grown up in South Gippsland, but Amelia didn’t meet Dan until much later in life and never imagined that she would one day return to her home region to join him in establishing a 165-acre pig farm specialising in high quality pasture raised pork! We care about the environment we live in. It’s our responsibility to keep our waterways in the best possible condition and care for the soil and to fix any erosion that was here prior to us coming. It’s our responsibility, and it is part of the reason we farm. Amelia Bright feeding pigs on her property at Amber Creek Farm, Fish Creek, 2016. Source: Museum Victoria, Photograph: Catherine Forge. Animal welfare is also a high priority at Amber Creek Farm. According to Amelia: ‘we care how the animals are raised and what we’re eating… the pigs are sentient beings, they deserve to have a high quality life and to not be stressed for their whole lives’. 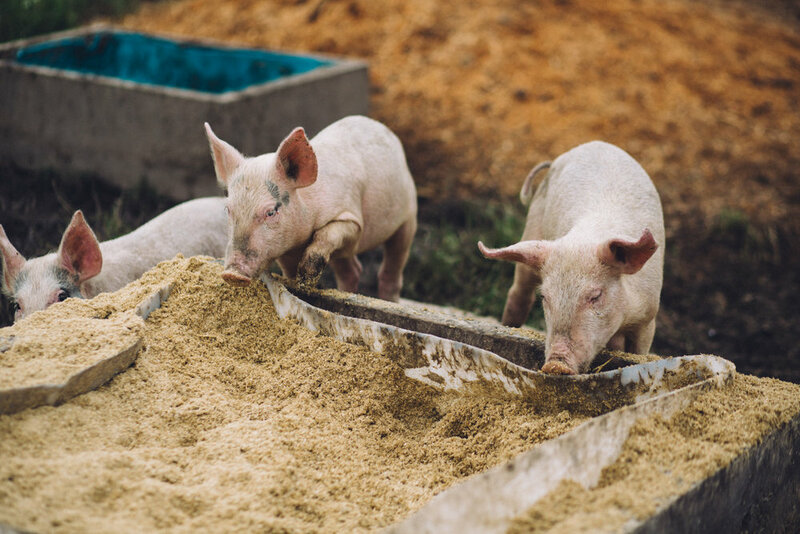 The pigs at Amber Creek Farm live outdoors for the entirety of their lives and have unrestricted access to shelter, fresh water and wallows at all times. Unlike other commercial pig breeds, they do not have their tails docked or their noses ringed to prevent foraging, and are instead free to roam in the soil and graze on a diet that is rich in nutrients and free of chemicals, hormones, drugs or GMOs. Confusion between free range, bred free range, pasture raised, barn raised, sow stall, sow stall free… it’s all quite abstract and relatively easy to manipulate those terms. You can still be called “free range” but technically live in a shed. So a lot of the problem is around language and the consumers will need to drive what happens within that industry space. We couldn’t run our business without the support of our local community. Our products are mostly sold within a 30-50km radius or less, and we’re able to do that because of the support of the community. By having a farm and being a farmer I get to be connected to our property and to our land and to our community. The connectedness I think overall is really important. My daughter really embodies my whole farming journey, cementing my place here on the farm. Hazel was born at almost 43 weeks, so I was feeding pigs up until about 40 weeks with her, and from day dot… Hazel is part of our journey and part of caring for the land. She’s part of us, and she’s part of the farm. It’s a brilliant education for her to see how food is produced and how animals and ecosystems interact with each other and the consequences of doing it properly, or having errors along the way. It’s a great way for her to learn, by having a visceral connection to the land and playing in creeks and bush and exploring. We’d really like her to grow up really capable and to see that both Mum and Dad can wield a hammer, and so can she, which she likes doing. She has complete choice over what direction her life is going to go in, and as long as she’s capable and can build those skills now, she continues to have choice. 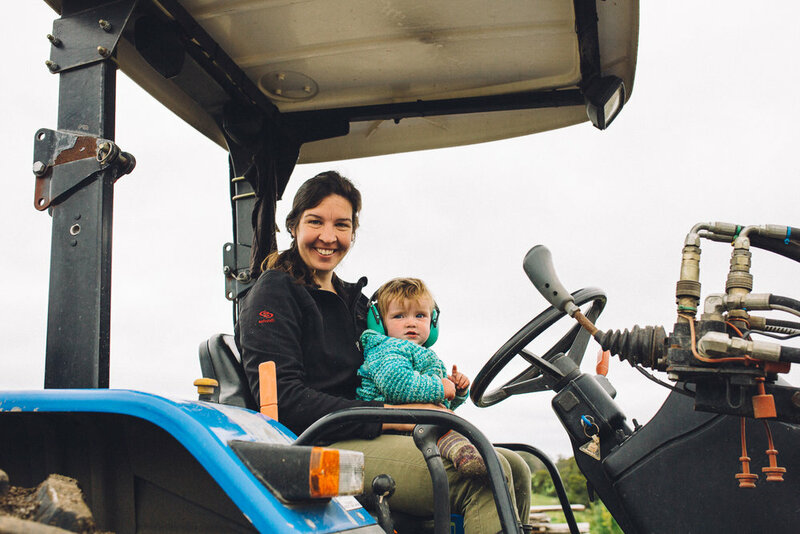 As a 28-year-old female farmer Amelia Bright looks to the future with cautious optimism, and holds hopes for a future where women like her daughter will have equal opportunities. However, when asked about the role that farming women play in current society she laments that some women’s roles continue to remain invisible in the public eye, perhaps due to the fact that they have contributed to the farm via an off-farm income, and perhaps because women are, quite simply, just too busy! I think between helping on the farm, working on the farm or off the farm and doing the lion’s share of the domestic duties, there’s not a whole lot of time for self-amelioration of ‘wow, look what women are doing’! We’re too busy. We just get on with it. *All quotes and material taken from an interview between Catherine Forge and Amelia Bright, Fish Creek, 2016, Source and Copyright: Museums Victoria, Registration HT 49676.